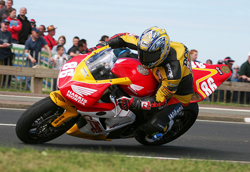 Cameron Donald, who was hotly tipped for success at the Centenary TT, will miss the event, it has been confirmed. The Australian suffered a suspected broken collar bone after a heavy fall in the main Superbike race at the North West 200 on Saturday. His crash meant the race was over just three laps. The TT podium-finisher will not compete at the Centenary TT according to Paul Phillips, TT and Motorsport Development Manager for the Isle of Man Department of Tourism and Leisure. Despite the setback for Donald, the North West allowed several leading TT riders to show their strengths ahead of the Centenary event, which starts on May 26. Bruce Anstey dominated, taking three wins for the Relentless Suzuki by TAS team. He was never troubled in the Superstock race, heading the field throughout and setting a new class lap record of 121.901mph. 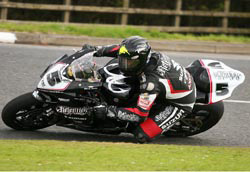 In the two Supersport races the five-times TT winner battled with John McGuinness, the outright TT lap record holder, Guy Martin and British Superbike star Steve Plater, who will make his TT debut this year, before taking victory in both. He also set another class lap record, at 118.407mph. Luck was obviously with the New Zealander - Anstey was given second place in the opening Superbike race despite the event being cut short thanks to him crashing at York Corner. McGuinness, the 11-times TT winner, took the top step of the podium. McGuinness also took two second and two fourth places, while Plater took victory in the main Superbike race - shortened by Donald's accident - as well as recording second, third and fourth-place finishes. Teammate Adrian Archibald had a positive day as he prepared for the TT. He was involved in a six-way battle for the final podium place in the Superstock event before settling for eighth place. He finished a solid eighth in the main Superbike race. 'Apart from Bruce, who did a great job for the team, it’s the BSB regulars that make up the top placings and some of the bar bashing involved is not for me.